I am not an expert on poverty in America nor would I claim to know firsthand what it means to live in poverty. As an educator who thinks about teaching and learning and how to deliver a high-quality education to all students, I am becoming more sensitive to and aware of the variables that impact a student’s ability to learn and achieve in school. One variable that can impact a student’s ability to learn is whether he or she lives in poverty. I read a recent article in Phi Delta Kappan by Pedro Noguera entitled, A Broader and Bolder Approach Uses Education to Break the Cycle of Poverty. This well-written and comprehensive article sheds a bright light on the challenges we face in school reform if we intend to improve the learning environment for children, especially those that live in poverty. Noguera offers his personal analysis of the underlying problems and then focuses his attention on the successful story of the Broader, Bolder Approach (BBA) reform plan in Newark, NJ. This group is responsible for developing a comprehensive school reform plan in seven schools in Newark’s Central Ward. I strongly encourage reading his article. Let’s look at some statistics on poverty in the United States to set the stage. In 2010, the poverty level for a family of four, two adults and two children was about $22,000 per year. The average cost of a two-bedroom apartment in Atlanta (where I live) is about $800 per month. The annual cost for renting a two-bedroom apartment for a family of four living in poverty would consume 46% of their annual income. It doesn’t leave much room for other needs like food, clothing, health care, transportation, and leisure. In 2010, about 15% of people in the US lived in poverty, one of the highest poverty rates since the early 1990s. This works out to about to about 46 million Americans. Poverty rates for black and Hispanic Americans greatly exceed the national average: about 27% of blacks and 27% of Hispanics lived in poverty, as compared to about 10% whites and 12% of Asians. a large body of research over several decades has shown that poor children face enormous education challenges specifically related to poverty. Over 50 years, numerous studies have documented how poverty and related social conditions, like lack of access to health care, early childhood education or stable housing, affect child development and student achievement. In his article, Noguera discusses three ways that poverty in urban neighborhoods adversely affects student achievement and the performance of schools. First, academic and social support is less available to students outside of school. “Social closure,” the supportive relationship that develops between parents and schools in wealthier communities is harder to realize. He points out that there is substantial evidence to show that supportive relationships between parents and schools positively impacts student achievement. In wealthier communities parents can supply their children with all the resources they might need to supplement their classroom experiences and increase their chance for success. Something poor families are unable to manage. A substantial body of research has shown that the quality of life and overall health of children in poor neighborhoods are significantly lower than for children in middle-class neighborhoods. If schools in poor neighborhoods are unable to address the non-academic needs of students they are trying to educate, they will likely experience overwhelming challenges when it comes to meeting the demands of NCLB. 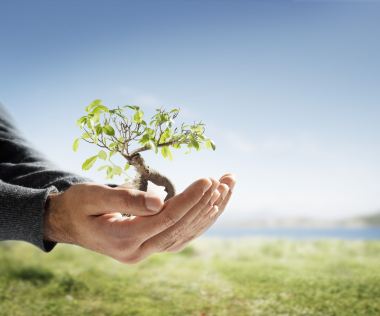 The environment a child is raised within has a profound impact on his or her ability to learn. Third, adverse conditions undermine the ability of parents and schools to influence the character of schools and ensure that they serve their interests. The presence of violence, drugs, poor housing, and other adverse environmental conditions can make it very difficult for parents and schools to attract the social and economic capital to support the school community. Unlike schools in affluent areas of a city, schools in poor neighborhoods will often function without support from local businesses, churches or other organizations. expand learning opportunities for students through quality early childhood education and by offering after-school programs to extend the learning experience. enrich the curriculum by offering support in literacy development in all content areas and placing greater emphasis on project-based learning. build critical partnerships that strengthen the ability of the schools to respond to the challenges students face. As I reflect on these three BBA initiatives, I cannot help but think about what makes Drew Charter School in Atlanta, GA a successful K-8 school with over 800 students. 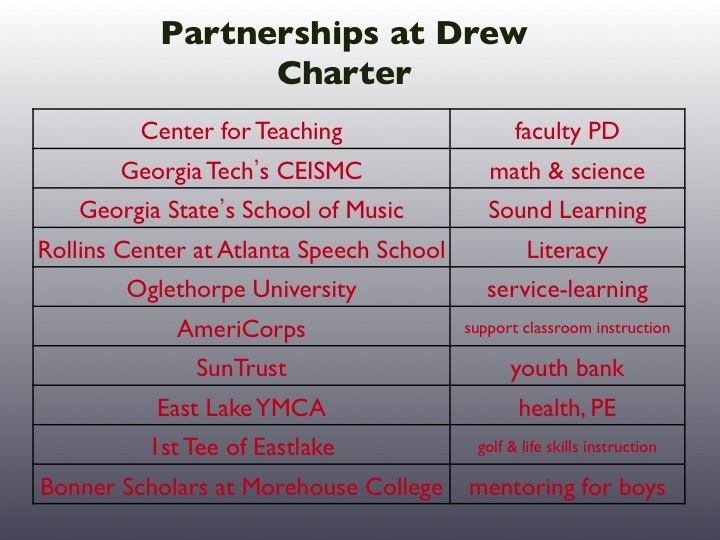 Drew, the first public charter school in Atlanta, GA, was founded in August 2000 and serves families in the East Lake area of the city. Nearly 75% of the students qualify for free and reduced lunch and the school has met Annual Yearly Progress (AYP) every year since its founding. Drew Charter is an integral component of the Miracle at East Lake, an urban revitalization project that was implemented through the generous and visionary efforts of the Cousins Family Foundation. As a result of this innovative urban revitalization project, two Atlanta-based non-profit organizations were born, The East Lake Foundation and Purpose Built Communities. The East Lake Foundation provides the tools for families of The Villages of East Lake and students of Drew Charter School to build a better life for themselves and future generations through education, mixed-income housing and community wellness. Purpose Built Communities’ (PBC) mission is to transform struggling neighborhoods into vibrant and sustainable communities where everyone has the opportunity to thrive. Their long-term vision is to break the cycle of intergenerational poverty, creating a world where geography no longer limits human potential. PBC assists other communities using a “holistic community revitalization” model (click here for a diagram showing their approach). As you study their diagram you will see all the elements of what Pedro Noguera writes about in his article and operates in the Broader, Bolder Approach reform plan. What is so exciting about these two examples, BBA and PBC, is that the hope we have for helping students out of the stranglehold of poverty is realistic so long as the educational model that supports them is based on a holistic community support effort. To work together as a community of teachers, staff, students, families and volunteers to provide a learning environment that emphasizes high achievement and character development.So we know what works. As Noguera points out, strategic, lasting partnerships are an essential component of what makes school reform work for communities that struggle with poverty. The question is are we going to invest in replicating these successful models for other urban and non-urban areas of the United States where people live in poverty. In the last post, Factors Leading to Success in School, I offered a diagram that pulled together the different variables that impact student achievement. This diagram (see below), along with Pedro Noguera’s wonderful summary of the challenges and opportunities before us, and the success of BBA and East Lake point the way for what we need to do to address school reform in the United States. Noguera, Pedro, A Broader, Bolder Approach Uses Education to Break the Cycle of Poverty, Phi Delta Kappan, vol 93, no 3, pp 8-14. Bob, thanks to you and the Center for Teaching for the work and efforts you are forwarding for educational reform and enhancement. I hope to continue my work with the CFT, and I hope I can contribute to the difference CFT wants to make. Many kudos to Drew for the example it sets everyday! Thanks to you as well. Let’s do our best to make this happen. We need to pursue some of the conversations we discussed around Georgia Tech. Broaden the conversation with other folks. When should we start and where?